If you don’t have a 4K HDR TV it’s hard to recommend the Apple TV 4K, because it really only adds a bit more grunt and higher-res output capabilities. Beyond that, it’s almost identical to the previous model, and the price is a lot higher than the competition – so it probably makes sense to go for 2015’s Apple TV if you have no aspiration to improve your set up. That said, those who've brought 4K HDR-ready televisions into their living rooms already will find that the Apple TV offers plenty of 4K content, along with some terrific upscaling capabilities that make everything look as sharp as possible. However, if you’ve got any inclination to upgrade to a 4K HDR TV in the future – and especially if you’re entrenched in the Apple ecosystem – then the Apple TV 4K is a pretty obvious choice. Yes, it’s pricey, but it’s slick, works well with an iPad or iPhone (or even a pair of AirPods), and the range of content is good enough right now. When Apple Arcade and Apple TV Plus both launch in Autumn 2019, there'll be a huge expansion of content you'll be able to sign up for, if the additional costs don't put you off. The Siri Remote is a real boon, offering helpful voice navigation and motion controls for basic games that children will enjoy, and the facility to connect sensors makes this an effective next-generation fitness machine as well. To reiterate: if you’ve not got a 4K TV, then you might as well just go for the older model of Apple TV, as the speed increases and higher capacity aren’t really offering enough. The speed of the interface is better, but still not perfect, and the App Store definitely needs more titles – we’d have expected a wider range by now, although it does seem that the trickle is becoming a steadier stream if the cross-platform offerings are anything to go by. If you’re already in the Apple-sphere and want a streaming box, the Apple TV 4K makes the most sense. It’s costly, yes, and there are cheaper options on the market if you just want to get high-quality images beamed into your eyeballs. But if you also want the wider app ecosystem, and the ability to connect sensors and use it as a workout trainer, play games with kids or control your smart home, then the Apple TV 4K is an easy choice. Even if you just want to make sure you’re future-proofed, the cost of the 4K version of the box isn’t that much more than the older model, and you’ll know you’ve got more grunt if you want to start using it as a micro-console. It’s not perfect, but the Apple TV 4K is now clearly far more than a hobby – it’s a real competitor, and a nice choice for the Apple fan with a fancy TV. While 4K HDR support was a relative rarity a couple of years ago, nowadays it’s much more common, and there are a number of boxes that come with a similar selection of streaming apps at a variety of price points. Their exact functionality can differ however, so we’ve outlined the options below. Google’s Chromecast products are designed to be as slimline as possible, and are controlled with your phone rather than a dedicated remote. The Chromecast Ultra is a very cheap alternative to the Apple TV 4K. It offers HDR support (including Dolby Vision), and Ultra HD content. One disadvantage is that while it supports a wide range of apps, Amazon Prime Video is absent, but if you don't consume a lot of Amazon’s content then it’s an excellent choice. Another negative is that because it’s completely controlled through your phone via Wi-Fi, rather than through a dedicated remote, it can be a little sluggish to respond depending on the speed of your internet. The Roku Ultra is Roku’s top of the line streaming device, and supports both 4K and HDR, although it lacks support for Dolby Vision. It is, however, much cheaper than the Apple TV 4K at $129. What it lacks in Dolby Vision support it makes up for in its interface. This is a nippy device that’s well supported with streaming apps to boot (a fact helped by the fact that Roku doesn’t have a streaming service of its own – it’s content-agnostic). It will even be getting an Apple TV app in the coming months. If you want to save even more money, then Roku’s Premiere+, which also includes 4K HDR, is an even more affordable model at $99. At just $49 (£49, around AU$68) the 4K Amazon Fire TV Stick packs in some great capability at a low cost and small form factor. 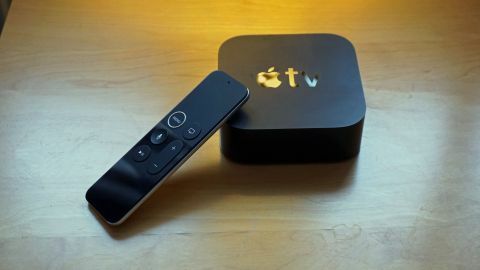 It’s got much of the same functionality of the Apple TV 4K thanks to its included Alexa remote – and the Apple TV app from this coming May – and the new 4K model also brings in HDR playback for more popping colors. It’s one to go for if you’re a fan of voice control and its snappy interface, and really offers a huge amount for the price. Image Credits: All images by TechRadar.